Here we are after a week reading Les Misérables. Thank you to all those who join this read-along, it's always so much more fun when you read a book like this with other people who share your curiosity and love for books. First of all, what made you read this book in the first place ? Until now, who is your favourite character and why ? Is there a special scene that really strike you this week ? Have fun and see you Sunday the 2nd December ! 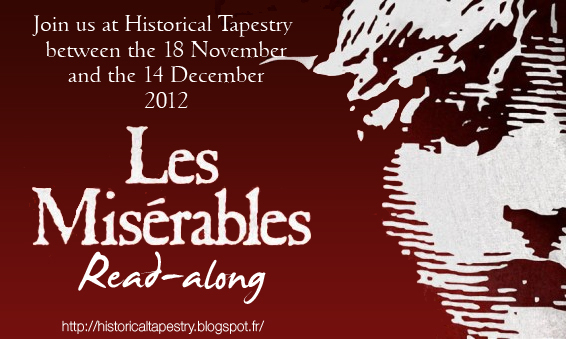 What made me read Les Miserables was I wanted to tackle this huge story to be able to say "yes, I've read that book." I can also relate when others talk about the story, or authors writing style, etc. Another reason is the movie will be showing in late December and I like to read the book first before watching it. Finally there was a curiosity about the book, the musical was famous and I know many who went to see it in NYC. My curiosity was in why this story is a classic, enduring, moves people? A special scene that struck me this week. Maybe I should not answer this one because I'm at the end of the story (page 902.) I'll wait to see what others express. I have been wanting to read this for years but was overwhelmed by the size of it. I bought it years ago but I no longer have that copy. A few weeks ago I picked it up at the op -shop for $2. I was so glad to find the read-a-long it just makes it seem less daunting. I had no idea what this book was about just knew of the success of the musical. I'm really enjoying the character development of all the main ones. Probably the Bishop is my favourite so far - just because of his altruism. The scene that struck me this week was when Fantine had her two front teeth removed for payment to support her child - as a mother I can relate to being prepared to do almost anything to help / care for your children. The desperation of it was very moving especially as you knew the cause was fabricated. I am really reading this because of the movie. It looks fabulous and I wanted to know what I was going to be seeing. I hadn't really given a lot of thought to reading it before now - it was always in that somwhat vague 'someday' list of books I have in my head. Daystarz Books, that scene had me cringing. I can't imagine being so desperate that that kind of action seems like the only option. I read it a few years ago in high school and now again because of the movie. It just seemed the perfect occasion to reread it. My favourite character this week is certainly Mgr Myriel. He is the first to actually give a chance to Jean Valjean despite his criminal past and other people's prejudice. Like Daystarz, when I read the scene where Fantine gets her two teeth removed I actually shudder. It's one of the most impressive scenes in the book for me.